An area of disturbed weather remains from near Belize to the Yucatan Channel. Scattered thundershowers are over the eastern Gulf. A Hurricane Hunter will investigate later today if necessary. Forecasts develop a low 100-200 miles west of Tampa, Florida over the next few days. They take it eastward toward the west central coast of Florida by Monday or early Tuesday. The low hasn't formed yet and forecast models may have significant errors. Please check my iphone / ipad app for specific Caribbean city forecasts and a three day video forecast. Just search for 'Global Travel Forecast' at the app store. The low level circulation appears to have formed. Satellite imagery shows a nice low level spin now. Deep convection is not far away, meaning that this system could go from tropical depression to tropical storm strength very quickly. Regardless of the strength with this low, significant amounts of rain is likely across the Big Bend of Florida southward to near Lake Okeechobee. The Hurricane Center will likely classify this as a tropical depression by this afternoon. 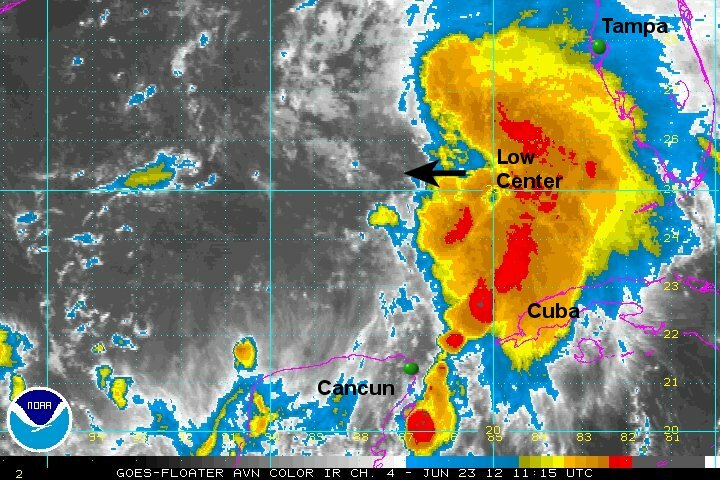 As of 8 am edt the low was centered at 25.4 N / 87.5 W or about 335 miles SW of Tampa, Florida. It was nearly stationary. Top sustained winds estimated at 30 mph. Pressure was estimated at 1003 mb. Forecasts are still taking the low in many directions in the Gulf. As with yesterday, I still believe that the most likely course will be toward the west central coast of Florida by late Monday or into Tuesday. 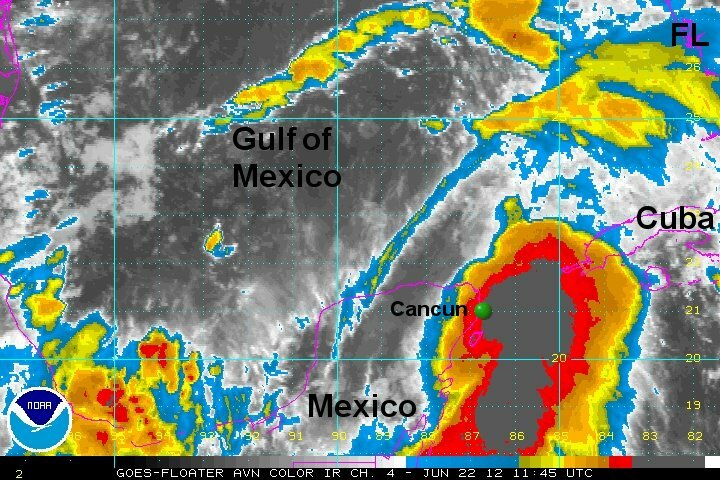 Satellite imagery and Hurricane Hunter data have confirmed that tropical storm Debby has formed. It is a badly sheared system with westerly winds keeping the deep convection to the east of the circulation center. 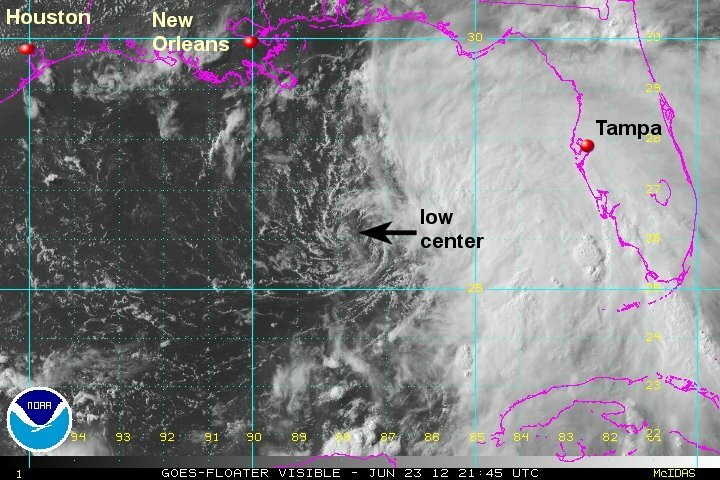 As of 5 pm edt the low was centered at 26.2 N / 87.6 W or about 220 miles SEE of the Mouth of Mississippi River. It was moving north at 6 mph. Top sustained winds estimated at 50 mph. Pressure was estimated at 1001 mb. Forecasts are still taking the low in many directions in the Gulf. The models are split taking Debby either east or west in about another 24 hours. NHC's official track is west.